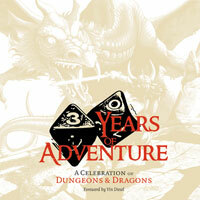 This is a collector’s item that gives a detailed look at the history of Dungeons and Dragons. Has great interviews with industry developers like Gary Gygax, Steve Winter, Zeb Cook, Jonathan Tweet, Weis and Hickman, and Ed Greenwood. Gorgeous artwork, beautiful hardcover. Foreword by Vin Diesel. Brand new in shrinkwrap! (blue cover) (9043). VG, contains all maps.